Population aging is an increasing median age in the population of a region due to declining fertility rates and/or rising life expectancy. Most countries have rising life expectancy and an ageing population (trends that emerged first in developed countries, but which are now seen in virtually all developing countries). This is the case for every country in the world except the 18 countries designated as "demographic outliers" by the UN. [not in citation given] The aged population is currently at its highest level in human history. The UN predicts the rate of population ageing in the 21st century will exceed that of the previous century. The number of people aged 60 years and over has tripled since 1950, reaching 600 million in 2000 and surpassing 700 million in 2006. It is projected that the combined senior and geriatric population will reach 2.1 billion by 2050. Countries vary significantly in terms of the degree and pace of ageing, and the UN expects populations that began ageing later will have less time to adapt to its implications. Population aging is a shift in the distribution of a country's population towards older ages. This is usually reflected in an increase in the population's mean and median ages, a decline in the proportion of the population composed of children, and a rise in the proportion of the population composed of elderly. Population ageing is widespread across the world. It is most advanced in the most highly developed countries, but it is growing faster in less developed regions, which means that older persons will be increasingly concentrated in the less developed regions of the world. The Oxford Institute of Population Ageing, however, concluded that population ageing has slowed considerably in Europe and will have the greatest future impact in Asia, especially as Asia is in stage five (very low birth rate and low death rate) of the demographic transition model. Among the countries currently classified by the United Nations as more developed (with a total population of 1.2 billion in 2005), the overall median age rose from 28 in 1950 to 40 in 2010, and is forecast to rise to 44 by 2050. The corresponding figures for the world as a whole are 24 in 1950, 29 in 2010, and 36 in 2050. For the less developed regions, the median age will go from 26 in 2010 to 35 in 2050. Population ageing arises from two (possibly related) demographic effects which are increasing longevity and declining fertility. An increase in longevity raises the average age of the population by increasing the numbers of surviving older people. A decline in fertility reduces the number of babies, and as the effect continues, the numbers of younger people in general also reduce. Of these two forces, it is declining fertility that is the largest contributor to population ageing in the world today. More specifically, it is the large decline in the overall fertility rate over the last half century that is primarily responsible for the population ageing in the world’s most developed countries. Because many developing countries are going through faster fertility transitions, they will experience even faster population ageing than the currently developed countries in the future. The rate at which the population ages is likely to increase over the next three decades; however, few countries know whether their older populations are living the extra years of life in good or poor health. A "compression of morbidity" would imply reduced disability in old age, whereas an expansion would see an increase in poor health with increased longevity. Another option has been posed for a situation of "dynamic equilibrium". This is crucial information for governments if the limits of lifespan continue to increase indefinitely, as some researchers believe it will. The World Health Organization's suite of household health studies is working to provide the needed health and well-being evidence, including, for example the World Health Survey, and the Study on Global Ageing and Adult Health (SAGE). These surveys cover 308,000 respondents aged 18+ years and 81,000 aged 50+ years from 70 countries. The Global Ageing Survey, exploring attitudes, expectations and behaviours towards later life and retirement, directed by George Leeson, and covering 44,000 people aged 40–80 in 24 countries from across the globe has revealed that many people are now fully aware of the ageing of the world's population and the implications which this will have on their lives and the lives of their children and grandchildren. Canada has the highest per capita immigration rate in the world, partly to counter population ageing. The C. D. Howe Institute, a conservative think tank, has suggested that immigration cannot be used as a viable mean for countering population ageing. This conclusion is also seen in the work of other scholars. Demographers Peter McDonald and Rebecca Kippen comment, "[a]s fertility sinks further below replacement level, increasingly higher levels of annual net migration will be required to maintain a target of even zero population growth". The worlds older population is growing dramatically. This map illustrates global trends in ageing by depicting the percentage of each country's population that is over the age of 65. The more developed countries also have older populations as their citizens live longer. Less developed countries have much younger populations. An interactive version of the map is available here. Asia and Europe are the two regions where a significant number of countries face population ageing in the near future. Within twenty years many countries in these regions will face a situation where the largest population cohort will be those over 65 and average age approach 50 years old. The Oxford Institute of Population Ageing is an institution looking at global population ageing. Its research reveals that many of the views of global ageing are based on myths and that there will be considerable opportunities for the world as its population matures. The Institute's Director, Professor Sarah Harper highlights in her book Ageing Societies  the implications for work, families, health, education, and technology of the ageing of the world's population. Most of the developed countries now have sub-replacement fertility levels, and population growth now depends largely on immigration together with population momentum, which arises from previous large generations now enjoying longer life expectancy. The economic effects of an aging population are considerable. Older people have higher accumulated savings per head than younger people, but spend less on consumer goods. Depending on the age ranges at which the changes occur, an aging population may thus result in lower interest rates and the economic benefits of lower inflation. Because elderly people are more inflation averse, countries with more elderly tend to exhibit lower inflation rates . Some economists (Japan) see advantages in such changes, notably the opportunity to progress automation and technological development without causing unemployment. They emphasize a shift from GDP to personal well-being. However, population aging also increases some categories of expenditure, including some met from public finances. The largest area of expenditure in many countries is now health care, whose cost is likely to increase dramatically as populations age. This would present governments with hard choices between higher taxes, including a possible reweighing of tax from earnings to consumption, and a reduced government role in providing health care. However, recent studies in some countries demonstrate the dramatic rising costs of health care are more attributable to rising drug and doctor costs, and higher use of diagnostic testing by all age groups, and not to the aging population as is often claimed. The second-largest expenditure of most governments is education and these expenses will tend to fall with an aging population, especially as fewer young people would probably continue into tertiary education as they would be in demand as part of the work force. Social security systems have also begun to experience problems. Earlier defined benefit pension systems are experiencing sustainability problems due to the increased longevity. The extension of the pension period was not paired with an extension of the active labour period or a rise in pension contributions, resulting in a decline of replacement ratios. The expectation of continuing population aging prompts questions about welfare states’ capacity to meet the needs of their population. In the early 2000s, the World Health Organization set up guidelines to encourage “active aging” and to help local governments address the challenges of an aging population (Global Age-Friendly Cities) with regard to urbanization, housing, transportation, social participation, health services, etc. Local governments are well positioned to meet the needs of local, smaller populations, but as their resources vary from one to another (e.g. property taxes, the existence of community organizations), the greater responsibility on local governments is likely to increase inequalities. In Canada, the most fortunate and healthier elders tend to live in more prosperous cities offering a wide range of services, whereas the less fortunate don’t have access to the same level of resources. Private residences for the elderly also provide many services related to health and social participation (e.g. pharmacy, group activities and events) on site; however they are not accessible to the less fortunate.. Also, the Environmental gerontology indicates the importance of the environment in active aging . In fact, promoting good environments (natural, built, social) in aging can improve health and quality of life, as well as reduce the problems of disability and dependence, and, in general, social spending and health spending..
An aging population may provide incentive for technological progress, as some hypothesize the effect of a shrinking workforce may be offset by technological unemployment or productivity gains. Due to the aging population, globally, many countries seem to be increasing the age for old age security from 60 to 65, to decrease the cost of the scheme of the GDP. Age Discrimination can be defined as "the systematic and institutionalized denial of the rights of older people on the basis of their age by individuals, groups, organizations and institutions". Some of this abuse can be a result of ignorance, thoughtlessness, prejudice and stereotyping. Forms of discrimination: economic accessibility, social accessibility, temporal accessibility and administrative accessibility. In the majority of the countries worldwide, particularly countries in Africa, older people are typically the poorest members of the social spectrum, living below the poverty line. ^ United Nations Development Programme (September 2005). UN Human Development Report 2005, International Cooperation at a Crossroads-Aid, Trade and Security in an Unequal World (PDF). United Nations Development Programme. ISBN 978-0-19-530511-1. ^ a b c World Population Ageing: 1950-2050, United Nations Population Division. ^ Chucks, J (July 2010). "Population Ageing in Ghana: Research Gaps and the Way Forward". Journal of Aging Research. 2010: 672157. doi:10.4061/2010/672157. PMC 3003962. PMID 21188229. ^ a b c d Issahaku, Paul; Neysmith, Sheila (2013). "Policy Implications of Population Ageing in West Africa". International Journal of Sociology and Social Policy. 33 (3/4): 186–202. doi:10.1108/01443331311308230. ^ United Nations. "World Population Ageing 2013" (PDF). ^ United Nations. "World Ageing Population 2013" (PDF). ^ Lutz, W.; Sanderson, W.; Scherbov, S. (2008-02-07). "The coming acceleration of global population ageing". Nature. 451 (7179): 716–719. Bibcode:2008Natur.451..716L. doi:10.1038/nature06516. PMID 18204438. The median age of the world’s population increases from 26.6 years in 2000 to 37.3 years in 2050 and then to 45.6 years in 2100, when it is not adjusted for longevity increase. ^ Fries, J. F. (1980-07-17). "Aging, Natural Death, and the Compression of Morbidity". The New England Journal of Medicine. 303 (3): 130–5. doi:10.1056/NEJM198007173030304. PMC 2567746. PMID 7383070. the average age at first infirmity can be raised, thereby making the morbidity curve more rectangular. ^ Manton KG (1982). "Manton, 1982". Milbank Mem Fund Q Health Soc. 60 (2): 183–244. doi:10.2307/3349767. JSTOR 3349767. PMID 6919770. ^ Oeppen, J.; Vaupel, J. W. (2002-05-10). "Broken Limits to Life Expectancy". Science. 296 (5570): 1029–31. doi:10.1126/science.1069675. PMID 12004104. ^ "Current Status of the World Health Survey". who.int. 2011. Retrieved 8 October 2011. ^ Yvan Guillemette; William Robson (September 2006). "No Elixir of Youth" (PDF). Backgrounder. 96. Archived from the original (PDF) on 2008-04-14. Retrieved 2008-05-03. ^ Peter McDonald; Rebecca Kippen (2000). "Population Futures for Australia and New Zealand: An Analysis of the Options" (PDF). New Zealand Population Review. 26 (2). Archived from the original (PDF) on 2008-05-27. Retrieved 2008-05-04. ^ Aging, National Institute on (2016-03-28). 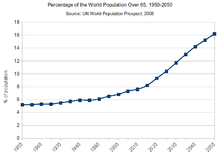 "World's older population grows dramatically". National Institute on Aging. Retrieved 2017-05-01. ^ Vlandas, T (2017-06-10). "Grey power and the economy: Ageing and inflation across advanced economies". Comparative Political Studies. 51 (4): 514–552. doi:10.1177/0010414017710261. ^ "Don't blame the elderly for health care costs". .canada.com. 2008-01-30. Archived from the original on 2014-02-19. Retrieved 2013-03-20. ^ "AgingMore1 | Evidence Network". Umanitoba.ca. Archived from the original on 2012-10-02. Retrieved 2013-03-20. ^ World Health Organization. "Global age-friendly cities: a guide" (PDF). WHO. Retrieved May 5, 2015. ^ Daly, M; Lewis, J (2000). "The concept of social care and the analysis of contemporary welfare states". British Journal of Sociology. 51 (2): 281–298. doi:10.1111/j.1468-4446.2000.00281.x. PMID 10905001. ^ Mohan, J (2003). "Geography and social policy : spatial divisions of welfare". Progress in Human Geography. 27 (3): 363–374. CiteSeerX 10.1.1.456.615. doi:10.1191/0309132503ph432pr. ^ Trydegard, G-B; Thorslund, M (2001). "Inequality in the welfare state ? Local variation in care of elderly – the case of Sweden". International Journal of Social Welfare. 10 (3): 174–184. doi:10.1111/1468-2397.00170. ^ Rosenberg, M W (1999). "Vieillir au Canada : les collectivités riches et les collectivités pauvres en services". Horizons. 2: 18. ^ Aronson, J; Neysmith, S M (2001). "Manufacturing social exclusion in the home care market". Canadian Public Policy. 27 (2): 151–165. doi:10.2307/3552194. JSTOR 3552194. ^ Sánchez-González, Diego; Rodríguez-Rodríguez, Vicente (2016). Environmental Gerontology in Europe and Latin America. Policies and perspectives on environment and aging. New York: Springer Publishing Company. p. 284. ISBN 978-3-319-21418-4. ^ Sanchez-Gonzalez, D (2015). "The physical-social environment and aging from environmental gerontology and geography. Socio-spatial implications for Latin America". Revista de Geografía Norte Grande. 60 (1): 97–114. doi:10.4067/S0718-34022015000100006. ^ a b Ogonda, Job (May 2006). "Age Discrimination in Africa" (PDF). ^ Gerlock, Edward (May 2006). "Discrimination of Older People in Asia" (PDF). Goldstone, J. A., Grinin, L., and; Korotayev, A. Research into Global Ageing and its Consequences / History & Mathematics: Political Demography & Global Ageing. Volgograd, Uchitel Publishing House, 2016.